(Bloomberg) -- For Wells Fargo & Co. investors who were hoping for a turnaround quarter, better luck next time. Revenue at the San Francisco-based bank fell 5 percent, the third drop in the past year, dragging the bank to an annual decline as peers boasted growth. Chief Executive Officer Tim Sloan also said the bank now plans to operate under a Federal Reserve asset cap through the end of 2019, rather than just the first half of the year, as previously forecast. Lower revenue and an extended ban on asset growth beyond end-of-2017 levels show that the bank has yet to bounce back from its problems. Sloan is trying to turn Wells Fargo around following a series of consumer scandals that erupted in 2016 with the revelation that employees may have opened millions of accounts for customers who didn’t want them. Wells Fargo shares were down 1.4 percent at 12:57 p.m. in New York, the worst performance in the 68-company S&P 500 Financials Index and pushing the bank’s decline for the past year to 24 percent. Total average loans sank 1 percent in the fourth quarter, driven by a decline in consumer lending, while average deposits fell 3 percent. Meanwhile, Citigroup Inc. and JPMorgan Chase & Co. showed growth in both metrics. 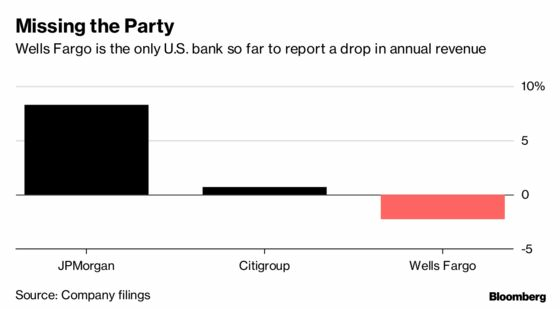 The drop in Wells Fargo’s deposits included $1.8 billion associated with the sale of 52 branches in the U.S. Midwest that closed in the fourth quarter. Provisions for bad loans fell 20 percent, the ninth consecutive quarterly decline and a sign of strength in the economy even amid rising rates and turbulent markets. Fees from mortgage banking, which drove Wells Fargo to record profits a few years ago, fell by half from a year earlier, reflecting heightened competition and a shift from refinancing to loan origination as rates rise. Mortgage woes are common across the industry: Fees from mortgage banking at JPMorgan also fell by nearly 50 percent in the fourth quarter. Net income fell to $6.1 billion, or $1.21 a share, beating the $1.19-a-share average estimate of 27 analysts in a Bloomberg survey. The bank’s efficiency ratio, a measure of profitability, worsened slightly in the quarter and ended the year at 65 percent. Wells Fargo has faced increased costs in recent years, the result of regulatory fines and legal expenses stemming from customer abuses. Sloan is targeting a 55 percent to 59 percent ratio in the long term, excluding litigation costs, and has promised $4 billion in cost reductions by the end of 2019. Net interest margin, the difference between what a bank charges borrowers and pays depositors, stayed flat at 2.94 percent, while analysts expected a slight increase.